The front of the Abe Store used to look somewhat different from the way it does in the final release. In fact, at one time it was not even called the Abe Store! In this post, Phantom River Stone examines the changes. Any piece of software undergoes many iterations of changes during its development, and Shenmue 1 was no exception. We can sometimes get a glimpse into some of these differences through material such as design documents or concept art - or by viewing footage of an earlier build of the game prior to its release. 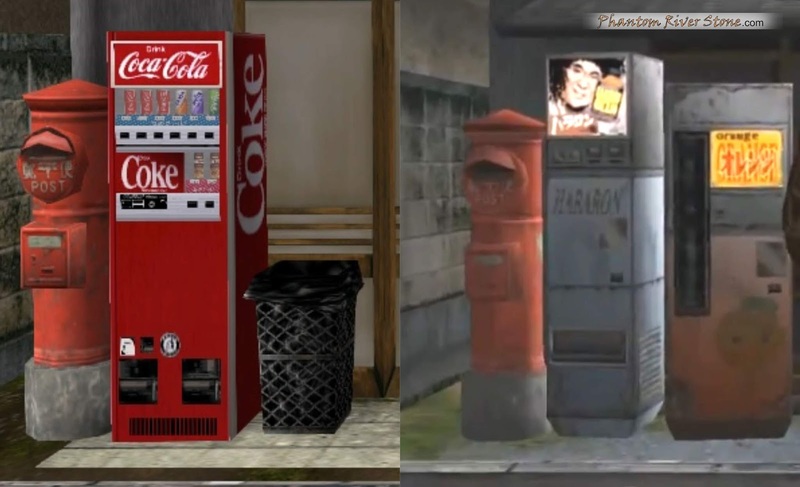 Fortunately for us Shenmue fans, a beta version of the first game is available within the community and in today's post we'll be looking at the way in which the facade of Ryo's local candy store, the Abe Store in Sakuragaoka, has undergone some changes compared with the final release version. As will be be familiar to most people, beta software refers to software that has finished in-house ("alpha") testing, and is created for a group of external testers to play under real conditions. Often design changes are made as a result of feedback from this testing. Here is a comparison of two screenshots showing the front of the Abe Store: the one on the left should look familiar as it is from the release version, while the one on the right shows the pre-release beta version. (Beta version still from a video by James Reiner). The Abe Store: final release (left) vs beta (right). A few differences are immediately noticeable. Let's run through them in turn. 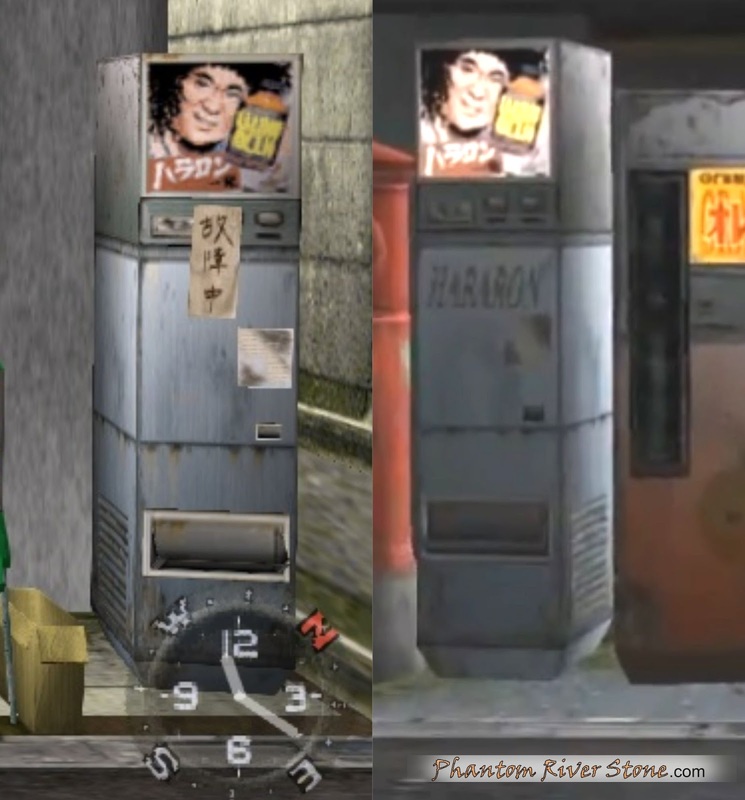 The old white vending machine outside the Abe Store features an image of Hiroshi Fujioka, who played the loveable Sega character Segata Sanshiro in a series of commercials. In his hand he holds some kind of small bottle, of the type often used for energy drinks in Japan. (We also delved into this in slightly more details in a previous post). In the release version, the machine is positioned at the right side of the store building and has an "out of order" label attached to it. In the beta version, there was no label (although the machine could not be interacted with) and it also faintly has the name of the drink inscribed on the front in green lettering: "HARARON". Energy drink vending machine (left: release vs right: beta). The release version features a drink vending machine (the Coca Cola branding shown here is only in the Japan release), with a trash can next to it for the empty cans. Ryo is able to buy a drink here. By comparison, the beta version of the game had an old rusty-looking drink machine advertising "orange" bottled drinks - but it was not possible for Ryo to actually purchase a drink from it. The number of capsule toy machines was reduced substantially from seven (beta), down to two (release). As was the case with the drink machine, one key difference is that in the beta version the machines were just for show and could not be interacted with. In the release version of the game, in keeping with the shops in Dobuita, the shop's hours of operation (9 am to 7 pm) are posted up inside the glass door in the form of a hand-written note. In the beta version this was not present. It may come as a surprise to learn that the Abe Store might have had a very different name. Hidden away in the 1998 Shenmue Premiere art booklet is a screenshot showing the store under a golden twilight sky. The layout of the post box and machines is the same as seen above in the beta version, but there's something different here with the store's sign: the name reads "Saitō Store" (斎藤商店)! This screenshot from the 1998 Shenmue Premiere art booklet shows that the Abe Store had been going to be named Saitō Store! The shop's name is derived from the store's owner, suggesting that the owner's surname was originally going to be Saitō, and a decision was made during development to change it to Abe instead. 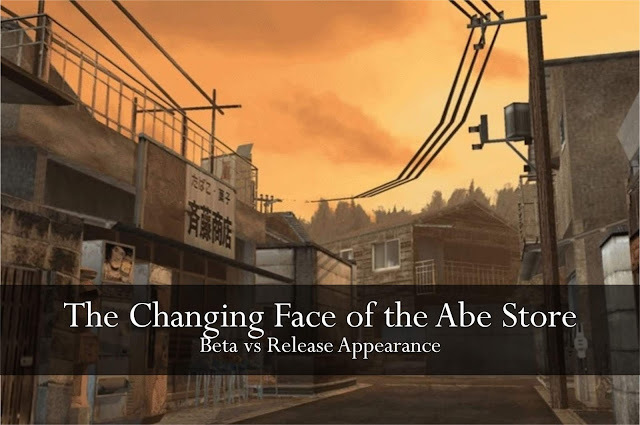 While the Abe Store in the release version has a timeless atmosphere about it, as if it has been that way for generations, as we can see it has in fact undergone a number of changes! It demonstrates well the meticulous tweaking and crafting that went into the design and tuning of the game, which may often not be apparent on the surface. This article was available early to Phantom River Stone patrons. Support the blog on Patreon and enjoy early access to all premium posts like this through-out the month!